Your choice will usually be a combination of desires and needs...and how much time and money you are willing to commit to your new endeavor. your end product will come into play. Weaving a rug or knitting a fine sweater will specify a fine or older, coarser animal. It will usually affect the price. -Buy the very best quality ( and most likely the most expensive.) At our farm, we are noted for our show quality alpacas and have quality females bred to high quality males almost guaranteeing your show ring success. * A word to the wise. Do Not neglect conformation. It’s much harder to correct than fiber which can be upgraded in just one breeding. Quality is quality. If you can see the dam and sire and even grandam and grandsire so much the better. You can see for yourself what you like and what traits are prepotent. -Take in ALL the information: The genealogy, The fiber analysis. The skin biopsy...everything. And educate yourself. There are many courses and websites out there that are dedicated to teaching the new alpaca breeder. Take the courses and shop around. Look for divergent opinions. In this industry they change continuously. -That fine fiber will “blow out” when you start feeding properly and you may have bought an unhealthy alpaca. Watch that histogram (the scientific analysis run on a sample of the alpaca fiber to see how “fine” it is at that time, what the deviation throughout the sample is “SD” and amount of coarser fiber present.) FYI, an older animal will have a much coarser fleece (generally) than a young one so don’t discount the older, proven animals but also know that there is a margin of error in all of them. There is a strange exception to our fleece analyzing techniques at this time. Even in the show ring...the “hand”, the way a fleece actually feels to the touch isn’t measured. Feel the fiber. -Everything should move in a straight line. -Is the spine straight all the way to the tip. It should be. -They’ve got to eat you know. *the bottom gum line, where it meets the tooth should line up or be slightly behind the top forward most point of the upper palate. 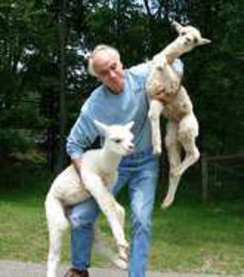 -Have a licensed vet do a pre purchase exam on your alpaca. -A farm with experience with people you feel good talking to will help you immeasurably in your venture. We are here to help.